Create a custom photo book from bonusprint to relive your favourite moments and look back on life’s big adventures. Check out our photo book options to get started and order your personalised album online. Whether you’re reliving your big day in a wedding album or saving snaps from your travels, there are loads of photo book options to choose from. There are sizes to suit all kinds of albums, from extra-large coffee table books to mini 10 x 10 cm albums. You can create a series of photo books in a matching linen cover or faux leather. And if you want a unique album to stand out on your bookshelf, why not create a custom photo book cover with your own image? Just head to our creator tool to start customising. First, select the book size and format to suit your snaps. You can relive cosy family moments in a medium landscape book. 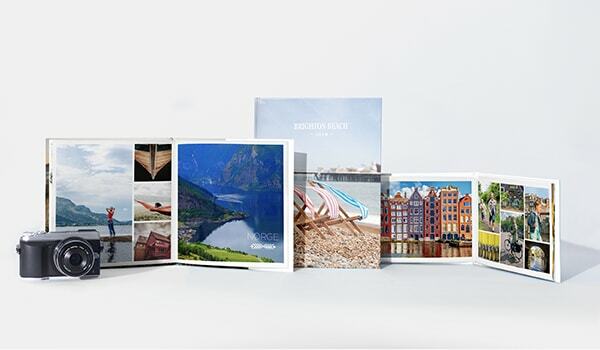 And why not use a large square book to show off your travel photos? When you’ve picked the book you want, start uploading the images you love and get creative with clip art, masks and more. There are loads of extra photo album options to choose from too, like high-quality gloss paper to give your images better colour contrast. And you can also select premium layflat on selected books, which is great for panorama shots and double-page spreads. In the creator tool, you can preview your photo book before you place your order. When you’re happy, click ‘add to basket’. If you haven’t selected a soft cover or a photo cover for your album, you can choose from our range of linen and faux leather covers at this stage. You can also customise your cover with a title. Once you’ve added all your extras, simply confirm your order, and we’ll send your new photo book to you. So, get exploring the full range of photo album options to start sharing your favourite moments.